Are you a fan of Factorio Game, then you are in the right place. We were getting a ton of requests to give out the list of the Best Factorio Mods. So we buckled up and went on the factorio mod community website and downloaded almost 300+ mods and came up with the best 20 Factorio Mods with Download Links. Factorio has an insanely good community with a very talented developer who create a lot of different kinds of mods. These are just our pick of the best factorio mod, so if you believe anything to be added then please do comment down below. So in this article, we have provided a list of the 20 Best Factorio Mods with Download Links. All the mods listed here require a legal Steam copy of Factorio. Otherwise you will not be able to download them. Resource Spawner Overhaul is Most Downloaded Mod in Factorio Game. There is a reason why Resource Spawner Overhaul and ill tell you the reason. Resource Spawner Overhaul was developed by orzelek. This mod was created two years ago. The functionality of this mod is it overrides in-game Perlin noise based resource or units spawning system by region divided spawning system. I’ll explain it to you in simple terms. This mod helps in changing the resource spawning to be based on a region, unlike the default resource spawning which is allocated by the game developers, This mod overrides that and makes resource spawner more often based on the region where you are playing factorio. FARL or Fully Automated Rail Layer is a very popular factorio mod. It is not really the most downloaded mod in Factorio but it is very important and also most rated by the players. FARL or Fully Automated Rail Layer was developed by Choumiko. FARL or Fully Automated Rail Layer functionalities are to customize the placement of poles, multiple parallel tracks, lamps, turrets and more with mapping or blueprints. FARL mode also places rails, signals, electric poles, concrete and others while driving. Fully Automated Rail Layer has two different modes such as Bulldozer mode and Maintenance mode. Bulldozer mode is more like a demolition mode. Bulldozer mode helps in removing signals, rails, poles, lamps, walls in behind the train. In Maintenance, mode removes rails, signals, poles, lamps, walls in front of the train and places new layout and replace them. Fully Automated Rail Layer mod also helps to remove trees, stones, rocks that are on the way and add them to inventory automatically. Fully Automated Rail Layer has a lot more functionalities and we recommend is to explore it yourself. Bottleneck is the third most popular and useful factorio mod. Bottleneck is developed by trold. Bottleneck is more like a tool that is used for locating input starved machines. This mod decorates assembling machines, furnaces, mining drill, pump jacks, and chemical plants with an indicator light, making it easier to identify bottlenecks in the factory. There are three color indicators such as Red, Yellow, and Green. Red is not currently doing anything, limited by the input, Green is currently doing stuff and Yellow is not currently doing anything, limited by the output. You can easily change the colors using the settings in the game. Rail Tanker is a very simple mod and just does one job, but it gets an insane amount of downloads. Rail Tanker is developed by Choumiko, Choumiko also developed the most popular mod in factorio called FARL or Fully Automated Rail Layer. Rail Tanker mod is nothing but it just adds a rail tanker in your factorio game. You can use this rail tanker to move or transport any types of liquid around the game without barreling it up first. Which makes transporting liquid really easy and fast. Factorissimo 2 is the fifth best factorio mod. Factorissimo 2 mod is used to build a factory or place down factories in the game. Not just that, you can also view the visible preview area which may not show the entire factory building. This mod was developed by MagmaMcFry and is being updated regularly. Quarry mod was developed by FuzzCat927. This mod as the name itself suggests that it somewhere involves with Mines and Ores. This mod lets you mine ores in the game using an ore patch. This mod also works without ore patch. Aircraft is a very interesting factorio mods. Aircraft mods add four aircraft with more benefits and other stuff with it. This mode has different types of planes such as Gunship which has good features such as limited combat abilities, fair maneuverability, and big cargo hold. The other type of plane is The Jet. The Jet is a different type of plane. It is designed to transport people from place to place and also attack using the Napalm Launcher. The Cargo Plane is a special plane designed to hold and transport the maximum amount of cargo using the airways. This plane has huge cargo hold but no combat facility. The final type of plane is The Flying Fortress. The Flying Fortress is the best and most powerful plane in terms of combat. The Flying Fortress features a Tank Cannon, high-speed machine gun, a missile launcher, and a huge equipment grid. This is a beast and the opponents fear. Aircraft was developed by SuicidalKid. Orbital Ion Cannon is a really cool mod. This is more like weapon mod. Orbital Ion Cannon was developed by Supercheese. Orbital Ion Cannon is Cannon that can be deployed in air or space. This mod lets you build a giant ion cannon and launch it into orbit with a rocket, wait for while for it to reach and then call it back with the aliens. To make this work you really need to be good with the positioning to target properly. All you need to do to implement this Orbital Ion Cannon is to select the position and trigger. that it and then watch the damages that are done using the cannon. Bio Industries is also a very beneficial and interesting factorio mod. This mod is used to deploy some useful buildings and products. This mod was developed by TheSAguy. Some of the buildings that are provided in this mod are Bio-Farm which is used to produce woods in the greenhouse, Bio-Solar-Farm is used to condense all the small solar panel into one big solar panel for consuming all the solar energy during the daytime. Bio-Garden is used to absorb and reduce pollution using green energy. Bio-Accumulator is an accumulator that condense those hundreds of smaller accumulators into a single unit. Solar Floor Mat is a floor mat that helps you to run fast using electricity. Bio-Cannon is an artillery unit that is used on combats and has a range of 85 bullets. Stone Crusher is used to crush the stones as the name suggests. Bio-Reactor is used to produce or manufacture biofuels and plastics. Some of the products that are available in this plugin are Seedling, Fertilizer, Wooden Fence, Big Wooden Pole, Wood Floors, Wooden Rail, Wooden Rail Bridge and many more. The Fat Controller is a factorio mod that developed by Choumiko, who also developed FRAIL and Rail Tanker. The Fat Controller is used to track trains and also check the next stop of the train. Using The Fat Controller mod you can also remotely control the train during emergencies or other situations. Advanced Logistics system is a very essential mod in factorio. It helps to keep track of items within your logistics network, it will show you a detailed list of all the items within and outside your logistics network, and provide you with tools to manage, sort, search and filter that information. The Advanced Logistics system provides you with information on your Logistics Networks, and the status of the robots within it, you can rename, and view each individual network and keep track of how many robots are charging or waiting to charge, you can also filter you items by a specific network. The system keeps track of all the logistics and non-logistics containers along with the items stored inside them and will provide you with a list of those items, you can also take a closer look at each of the items and inspect where it’s being stored. The system also comes with some useful tools, such as utilizing robots to view the location of a container or ordering your robots to deconstruct a container, there are also some experimental tools that can be enabled by the brave, these include teleportation and remote container upgrades. This mod was developed and owned by anoutsider. Squeak Through allows the player to walk between obstacles such as directly adjacent solar panels, pipes, steam engines, mining drills, and chests. The squeak through mod is really interesting and helps you stay stealthy in the game. Using this mod you don’t need to worry about obstacles and other stuff that could ruin your gaming experience. Squeak Through was developed by Supercheese who also developed factorio mod such as Orbital Ion Cannon. AAI Programmable Vehicles is a mod that lets you program and control vehicles remotely. This mod helps you in multiple situations such as can be used to destroy the enemies zone, friendly base navigation, vehicle-based mining, vehicle-based resource transportation, and more advanced applications. Works with vanilla and modded vehicles. AAI Programmable Vehicles was developed by Earendel. Robot Army is one of my favorite factorio mod. Robot Army mod is used to build and deploy automated robot soldiers to attack enemies and also safeguard the base. It’s a very simple mod with multiple purposes. Robot Army was developed by kyranzor. You can also command the robot to do what you want them to do. It’s more like a personal soldier for you. Air Filtering is quite an interesting mod, to be honest. Air Filtering mod’s purpose is to build machinery that can reduce pollution. It also has inventory for air filterings such as air filtering machine, new filters, and other relevant items. Air Filtering mod was developed by Schorty. Space extension mod is an inspired mod. This mod was inspired by SpaceX. The purpose of this mod is to provide a significantly longer endgame experience. Instead of requiring a single satellite launch, you will now require in excess of 40 launches, and of a variety of components. The goal now is no longer to simply launch a satellite but to build a vessel capable of getting you off the planet and home safely. In addition to building components for your spacecraft, you will need to vastly increase your science in order to research all the required components. In fact, regardless of how much science you have built already, I pretty much guarantee that it will not be enough! Science is one of the best on-going consumers of resources, and so it is to this end that the final component for the spacecraft, the FTL drive, is a truly massive scientific undertaking. This mod was developed by LorKTor. Sea Block is a very simple factorio mod and just one purpose. Sea Block is used to deploy addition space on an island or defend the island by building walls around it in a single click. Sea Block is developed by Trainwreck. Dectorio is also one of my favorite mod because I use it to add decorative elements for the factories in Factorio game. You can add decorative elements such as colored signals, wooden, chain-link, stone, and concrete walls, hazard gates, signs, wooden floorboards, gravel, concrete styles, and the developer is updating very frequently. Dectorio is developed by PantherX. Omnimatter condenses all ores into a single ore from which everything is extracted. Omnimatter works with bob, vanilla and also the angel. Omnimatter factorio mod was developed by EmperorZelos. Omniwood is also from the developer EmperorZelos and the purpose of Omniwood mod is to add wood for the production method of Omnimatter. We did our research and came up with this list of 20 best factorio mods for the factorio gamers. If you have any suggestion or request then please do comment down below. If you need any favor then please contact us using the contact us form and please share it with your friends. Thank You. Your review was updated for 2019?? Rail Tanker has been deprecated since 0.15 and hasn’t even been updated since late early Q1 2017. Good job curating severely outdated mods. 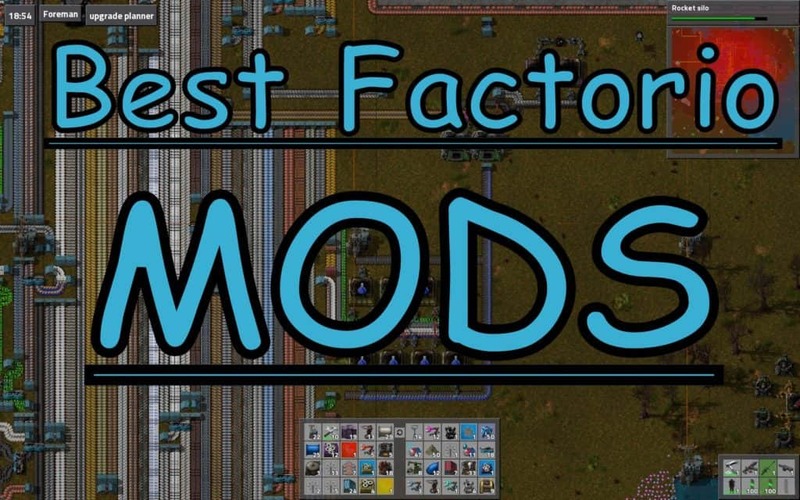 Thank You for your feedback John, according to you what are the best factorio mods that deserved to get placed in this list?